The Public Sector Scorecard is an integrated strategy mapping, service improvement and performance measurement framework. It extends and adapts the balanced scorecard to fit the culture and values of the public and voluntary sectors and has been used in Canada, Chile, South Africa and Uganda as well as in Europe. The PSS focuses on outcomes – service user, strategic and financial - the processes that lead to those outcomes, and the capability, behavioural and organisational factors that are needed to support staff and processes. The latter include trained and motivated people, good partnership working and sufficient resources, together with a culture of innovation and learning rather than a top-down blame culture - all underpinned by effective and supportive leadership. The PSS is a worksop-based approach and has three phases - strategy mapping, service improvement, and measurement and evaluation Click here for more information on How the PSS works. "The Public Sector Scorecard has moved performance management from a top-down, blinkered, blame-game approach to a system founded on inclusiveness, cooperation and understanding ... and that is no mean achievement". Neil Robinson, the Operational Research Society. "The PSS was very helpful, as it enables one to see what's happening across the health and social care system and where the balance of risks lies." "The PSS strategy map captures a useful strategic overview of the key interrelationships and shows how measures relate to the whole systems view." 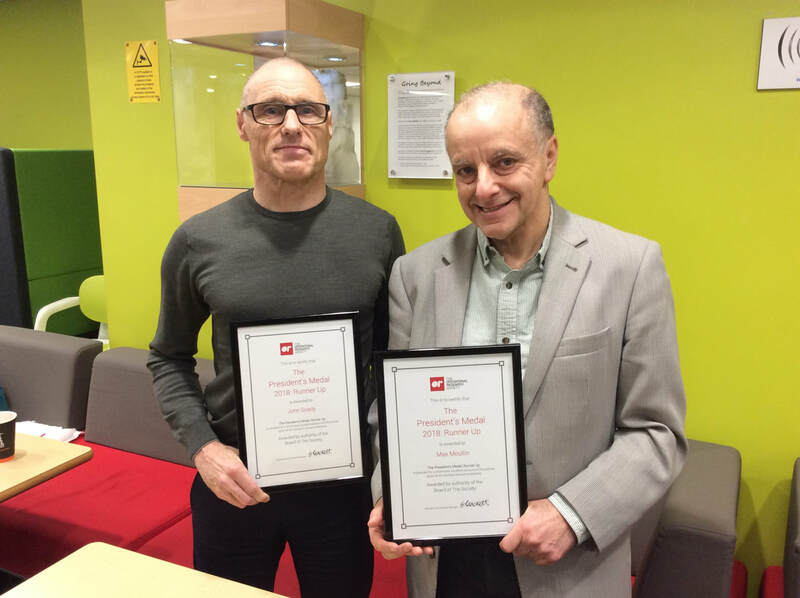 Max Moullin and John Soady (Public Health principal at Sheffield City Council) received special certificates at the Royal Society in London from the President of the Operational Research Society. This was for the paper 'Improving Sheffield's Health with the PSS' which was runner-up for the Operational Research Society's President's Medal which is awarded to the best practical application of OR. The paper discussed three projects using the PSS in Sheffield - helping people stop smoking, reducing child obesity, and integrating health and social care to reduce unnecessary admissions to hospital. Developing Strategy and Performance with the Public Sector Scorecard, One day interactive workshop organised by the Operational Research Society, Birmingham on 9 October. Click here for further details and to book a place! Moullin, M. (2017) "Improving and evaluating performance with the Public Sector Scorecard", International Journal of Productivity and Performance Management, Vol. 66 Issue: 4, pp.442-458. Click here to download the paper. Over 700 downloads in one month! Article by Max Moullin in Public Finance on Flawed Targets and the Ambulance Service - A Happy Ending? The Public Sector Scorecard Research Unit provides consultancy, training and research research on strategy mapping, quality, service improvement and performance management in the Public and Voluntary Sectors. ​For more information on our services click here or download our brochure. Please leave your contact details here to receive latest information or to become more involved in the work of the Centre.